Wide Receivers have proven to be just as valuable as running backs this season, if not more valuable, and a lot healthier too. Not counting QBs, there are 34 players in one of my leagues with 100+ fantasy points, 20 of them are WRs, 9 are RBs and 5 of them are TEs. 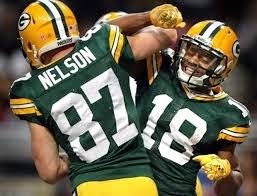 Are they the best receiving duo in the NFL? Vincent Jackson and Louis Murphy just each gained 100 yards against the Bears. Calvin Johnson exploded on Thanksgiving with 11 receptions for 146 yards and 2 scores. Eight different wide receivers have gained 100+ yards against the Eagles. Three times, 2 receivers from the same team in one week! Dez was quite on Thanksgiving gaining just 73 yards on 4 receptions against Philly. Tony Romo-Andrew Luck shootout. Just pray for it! The Panthers played the Saints in Week 9 and Benjamin had just 2 receptions for 18 yards, but he was targets 10 times. It was the rookies worst game of the season, but New Orleans has allowed 5 100 yard receivers. Benjamin made his NFL debut against the Bucs, and caught 6 passes for 92 yards and scored a TD in Week 1. The Browns have also allowed four receivers to go over the century mark, including rookie Mike Evans in Week 9 who caught 2 touchdown passes. Allen Robinson is done for the season, and he led the Jags in targets by 20! Blake Bortles will have to find a new favorite target. Watch how things develop in the next two weeks against the Colts and Giants. All 3 receivers saw 8 targets in Week 13 vs Giants, but Lee led with 6 receptions for 75 yards and touchdown. Only the Texans allow more points per game to WRs but no team has allowed more yards gained. The Miami Dolphins, Jacksonville Jaguars and Houston Texans matchup with the Ravens in the fantasy playoffs, and guys like Jarvis Landry, Cecil Shorts, Marqise Lee and Allen Hurns can help advance your team in the playoffs and are still available! If you own Andre Johnson and/or DeAndre Hopkins, you just need to pray that the Ryan Mallett move was the right one! just pray that their QB can stay healthy and they heavily target these two! The Bills Chris Hogan has now caught 27 passes and scored three touchdowns over the Bills last 7 games. If you can add him do your bench, hold onto him. It will help you down the road if you lose a receiver to injury. If you made it this far and you own Jordy Nelson/Randall Cobb (@ Buccaneers) and/or Torrey Smith/Steve Smith (@ Texans), you should be expecting to hoist that championship trophy! If you made it this far and you own Larry Fitzgerald/Michael Floyd (vs Seahawks) and/or Brandon Marshall/Alshon Jeffery (vs Lions), good luck!